Advanced Card Systems Ltd. (ACS) has launched the ACR31 EasySwipe application, which displays information from bank cards swiped through the ACR31 Magnetic Stripe Card Reader. 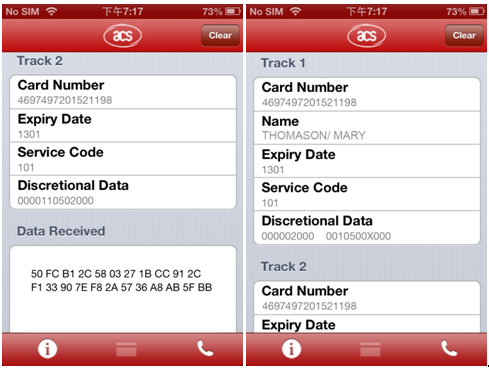 Supporting iOS 3.1 or higher , this application can show a banking card’s number, expiry date, service code and discretional data. While the application is developed for demonstration purposes only, (and thus may not be used for actual banking transactions, purchases, etc. ), it shows the functionality of ACR31 Magnetic Stripe Card Reader, and provides developers with cues when creating applications of their own using ACR31. The ACR31 Magnetic Stripe Card Reader is simply plugged into a smartphone or tablet. Used with a corresponding application, the ACR31 enables transactions anytime, anywhere. Data accessed via the ACR31 will be encrypted when sending into the mobile device, and therefore not be accessible to unauthorized parties. Because magnetic stripe card data will be accessed via smartphones or tablets—which most users already own—the time it takes for an end user to become familiar with the ACR31 is cut down. Downloading an app and plugging the ACR31 into his/ her smartphone or tablet is also much easier compared to setting up a comprehensive Point-of-Sales (POS) terminal. ACS will be coming out with an Android version of the EasySwipe application. Stay tuned for updates! Come and try out ACS’s apps with ACS readers on Android platform! 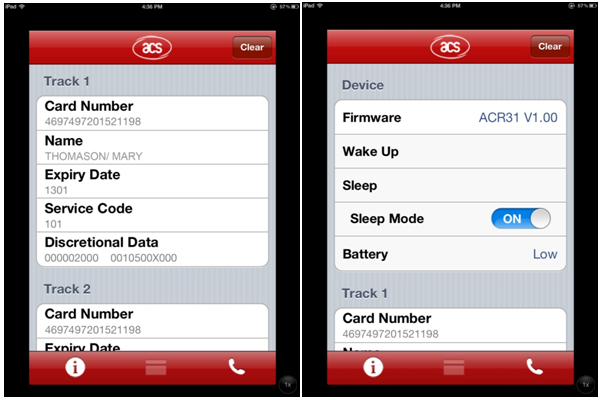 Droid apps available for ACS smart card readers. Check them out!